Currently in the archaeological area of Pompeii it is in course a research focused on the type of vegetation used at that time for green spaces, thanks to a method that used new technologies and thanks to the presence of specialists in biology and botany. 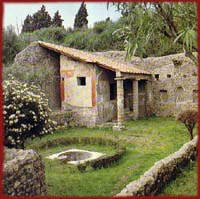 The architecture of the garden was particularly cared in Roman environment. The house had large open spaces, on which rooms leaned out, surrounded by a peristilium, adorned with flowers and plants. These spaces, called viridarium, besides being a place where to spend pleasant moments, had religious meanings, connected with nature and its relation with the divinities of the seasons; they served to cultivate the flowers for the crowns destined to the offers to the gods; they produced medicinal plants for daily necessities; finally, they made more pleasant life with the sight of the flowers in different seasons and with the strong smell of the Mediterranean flora. After all every plant had its own allegorical meaning and for this it was used in the religious ceremonies: laurel was synonymous of wisdom and heroic virtue; oleander, symbol of death; arbutus, represented eternity; viburnum, the plant of the triumphs; rose symbolized love; plane – tree, that not for a case in Pompeii adorned the Palæstra (Gymnasium), was metaphor of strenght and resistance to the adversities of life; violet was the weding flower for excellence; white cysts with five petals, was symbol of the human frailty. All these types and others like lily, carnation, orange blossom, periwinkle, date palm, ivy, are reproduced carefully in the paintings of garden, whose vivid colors covered the inside rooms of the houses, extending the closed spaces and recreating, in this way, the amenity of the open spaces. The study on vegetable species allowed to recognize every plant, every bush, every flower. This gave a rebirth to gardens like an essential part of the restauration of the houses, respecting mostly ancient cultivations. This has been made possible for the ground in Pompeii didn’t suffered any substantial upheavals from the time of the eruption; moreover, the modern technologies to recover the pollens from the ground, through which plants have been recognized, allow not only to know the ancient vegetation but also the same disposition of the ornamental plants inside the gardens. In this way, scientific studies allowed to relate different methods of work; they improve in visitors the comprehension of that marvellous reality that it is Pompeii, able to offer unforgettable emotions.